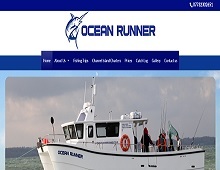 Ocean Runner Charters offer deep sea fishing in Poole and a great range of deep sea charters in Dorset. Skippered by Ryan Jones, who has been sea fishing since the age of 8, Ocean Runner is a 40ft Catapult catamaran that was specially designed for deep sea fishing and has space for up to 12 passengers. Operating out of Poole Harbour Ocean Runner Charters are available for fishing trips all year round. As well as boat charters in Poole, which are fantastic for amateur & serious anglers, stag trips and corporate team building excursions, Ocean Runner Charters can also offer birdwatching and sightseeing trips for those who just want to experience the beautiful Dorset coastline onboard this lovely boat. Ocean Runner has kitchen facilities, a heated wheelhouse and can handle choppy waters very well ensuring you have a comfortable and enjoyable trip. With a wide range of trips available, and an even wider range of fish to be caught, Ocean Runner Charters can offer fishing trips to meet all needs and are the perfect choice if you’re looking for Dorset charter fishing. Next time you’re thinking to yourself “I wonder if there is any sea fishing near me” or you’re looking for a new experience contact Ocean Runner Charters.